On Friday, they arrived! 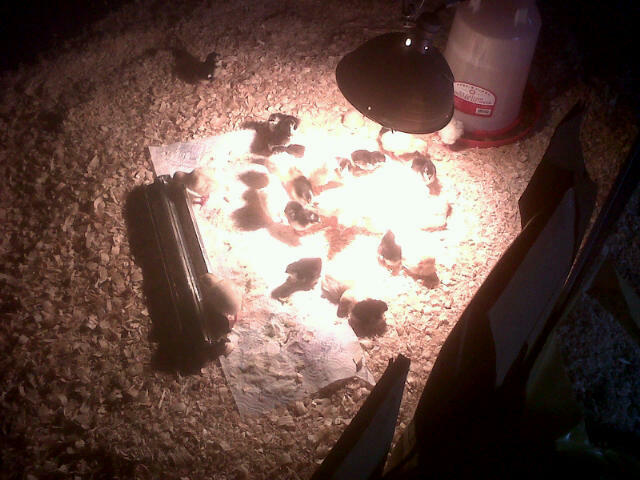 Lost a couple in transit, but 14 Black Australorp pullets and 16 white broad breasted turkeys arrived at Serenity Valley. They're fun to watch. Not sure if the turkeys are brave or stupid, but where the chicks scatter and run when you enter their pen, the turkeys will come up and start pecking at you. Looking forward to seeing them grow. Looks like summer may actually be here. The monsoons of spring have stopped and the temps have jumped. Been extremely busy at the farm, mostly catching up with mowing! It's always amazing how quickly grass can grow when there's a bit of rain and a bit of sun. 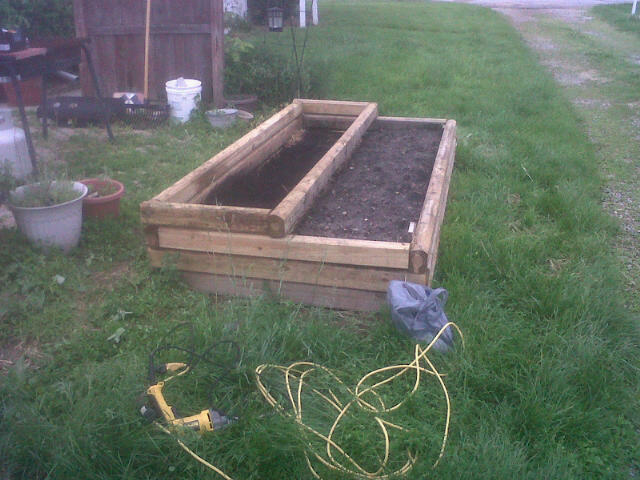 Have one of the raised beds near the back patio completed. 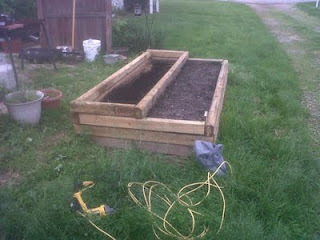 Haven't taken a complete picture yet, but this was just before the final addition of top soil. It currently has a Thai basil, cilantro, rosemary and some lettuce planted in it. I think the other one is going to house some strawberries. 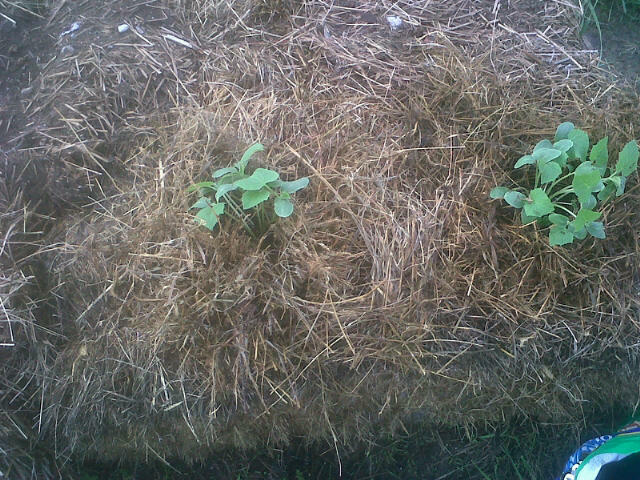 Have also decided to try to put in a couple straw bale gardens. Since we got a late start and haven't been able to work the ground in the garden area much, the straw bale (or in our case hay bale) garden idea has promise! There are currently 6 bales in the regular garden area ... here's a picture of 2 cucumber plants in them. Unfortunately, they weren't ready and we didn't have the rain as predicted after I planted the cukes... and they burnt up. Working on the bales again and will hopefully have a few cucumbers, some pole beans and some nasturtiums living in the bales. There are also 7 bales up against the chain link rabbit kennel. The plan is to work them into beds as well and use the space for squash -- allowing it to trellis itself up the chain link. Looking forward to seeing how this process works out. 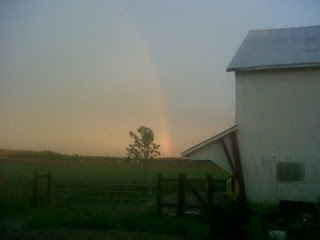 Last but not least... a picture after the last bad rainstorm we had go through. It was a week or so ago, but it's a nice picture.